If you need more styling than what we provide on customizer, you can utilize this Additional Style. Please use this option to modify CSS code rather than change the original file directly. Sometimes you need to add custom fonts to your site if you think Google Fonts not enough. 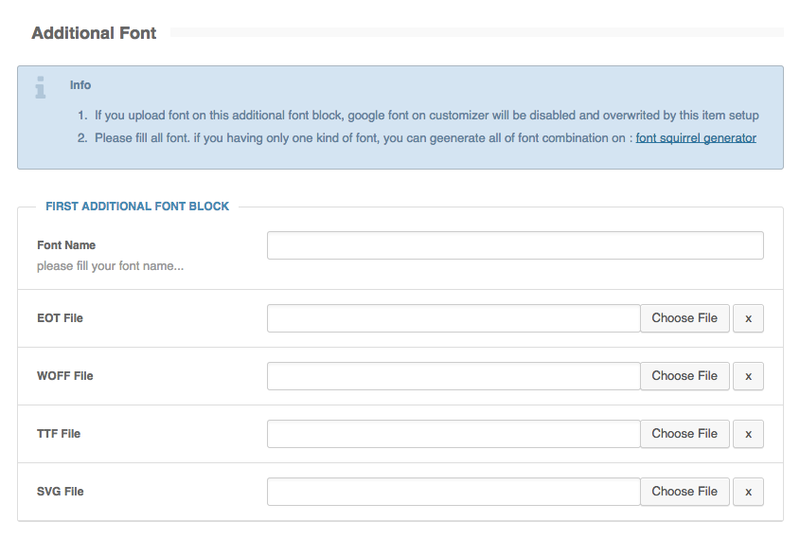 To add custom font, you need to upload font files in 4 file types, which is : EOT, WOFF, TTF and SVG. Luckily, there is web service called FontSquirrel Web Font Generator that’s make your life even easier to generate webfont. Please Note Respect the font copyrights, not every font is technically build and/or legally licensed for web usage.